(WASHINGTON, D.C., 8/27/18) — On Tuesday, August 28, the Council on American-Islamic Relations (CAIR) will host a live “Know Your Rights as a Student” discussion on Facebook for Muslim youth and parents. 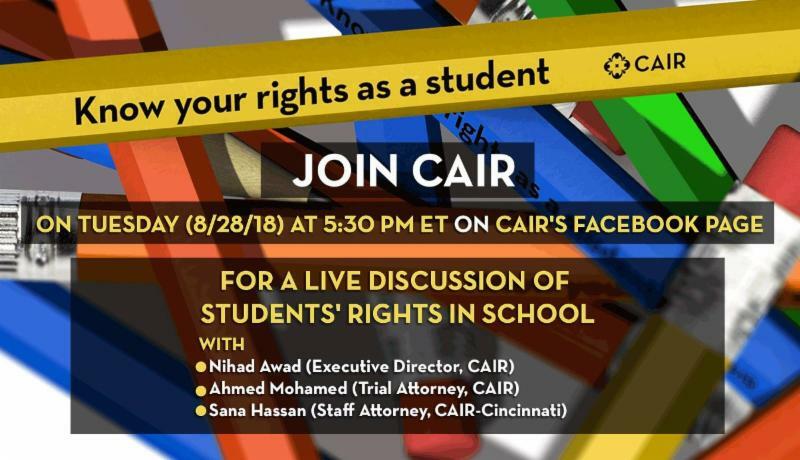 CAIR National Executive Director Nihad Awad, along with two CAIR attorneys — Ahmed Mohamed and Sana Hassan — will lead the live discussion. Topics to be discussed include the religious rights of students in public schools, issues — like bullying — facing Muslim students and how to ask school officials for constitutionally-guaranteed religious accommodations. CAIR attorneys will also answer viewers’ questions. CAIR also offers a booklet, called “An Educator’s Guide to Islamic Religious Practices,” designed to help school officials provide a positive learning environment for Muslim students.